We made it to Friday! 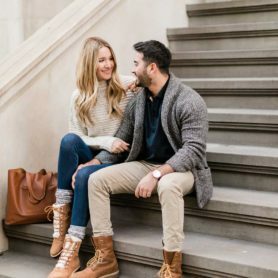 Not only did we make it to the end of the week, but the Nordstrom Anniversary Sale is now open to everyone! If you’ve been waiting, now is the time to take advantage of all the deals and restocks. This is one of those sales where things are constantly getting restocked, so I strongly recommend you keep checking back on the pieces that you love. It could be out of stock in the morning and then available in your size a few hours later! 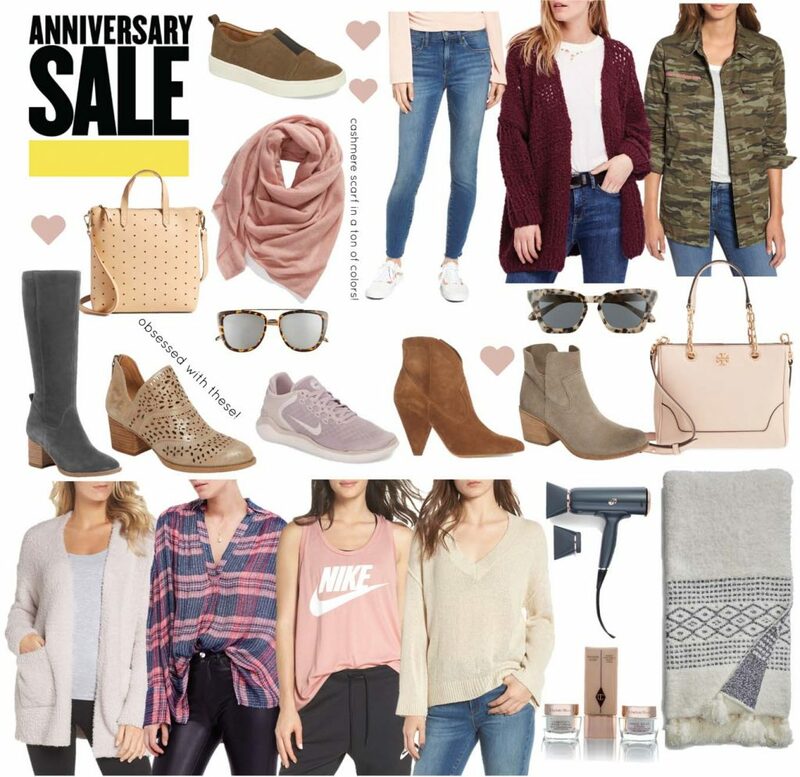 Since the sale is a little overwhelming, I’m sharing my top picks from the Nordstrom Anniversary Sale and the pieces I don’t think you should miss! This is the best time to not only stock up on fall and everyday wardrobe staples, but it’s a great time to shop for beauty, home and menswear too. This is the time of year that I buy beauty pieces and products. I load up on my tried and true favorites, but I also like to test new skincare products that I have been wanting to try and want to score at a great price. Did I mention that the sale has great home decor as well! This year, I also picked up a new blanket as a splurge and the matching pillows, and after reading the reviews, I think I’ll need another. If you’re on the lookout for a great basic sweater for every season, this neutral one is one of my favorites. For men’s pieces, I always pick up Armaan a pullover and loafers that he uses the entire year. 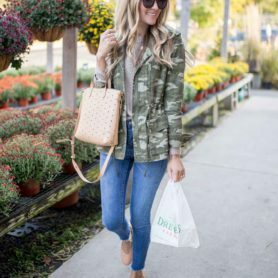 Basically, if you’ve been thinking about adding some new pieces to your fall wardrobe or want to get a jump on gift buying, now is the time to do it! OLIVE MOTO JACKET // FIT: true to size! This jacket comes back every year, and every year I have to pick one up! I love this year’s different take on it – especially the color. It still is an amazing quality and the fit is as always, amazing. I’m wearing a small! WHITE TEE // FIT: runs big! I would either get your normal size or size down in this. But I always stock up on a ton of these each sale (and for under $20 it’s a great deal!). They wash really well too and don’t get holes easily! THERMAL BUTTON DOWN // FIT: oversized! Size down if you want a more form fitted look! It definitely runs big and the style is bit looser. I’m wearing a small and love the way it’s a bit slouchier and I can tuck in. KNEE HIGH BOOTS // FIT: true to size. Get your normal size is these boots! They feel great after the first wear, but they are a bit slouchy and don’t stand up straight. I like that look, but online they look like they stay straight, and they definitely are a bit more flexible! 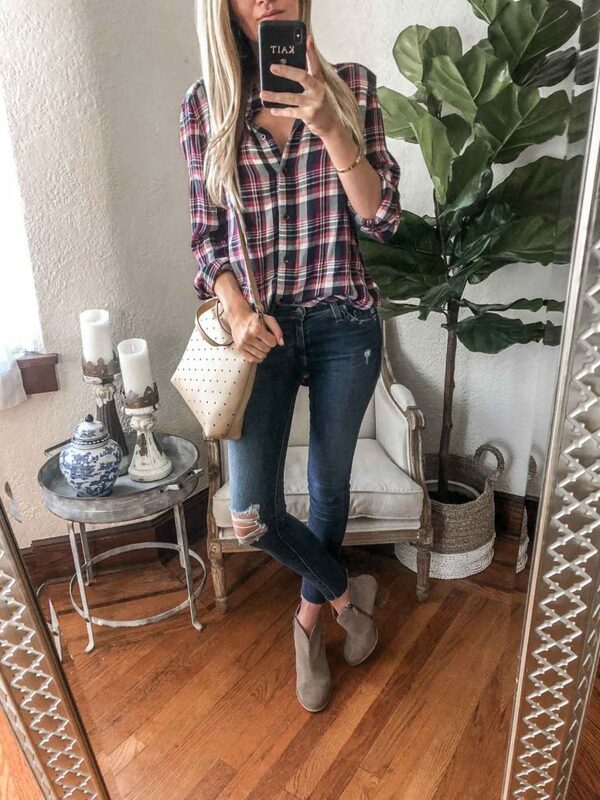 PLAID BUTTON DOWN // FIT: true to size, runs just a bit on the big size! I’m wearing a small and like the oversized fit and the fact that it’s longer in the back. If you wanted a more form fitting look, size down. DISTRESSED DENIM // FIT: true to size. This brand of denim is my absolute favorite. They last for years and wash really well. No fading at all! BOOTIES // FIT: true to size. Super comfortable and go with everything! Will be cute with dresses and jeans all season long. CROSSBODY TOTE // I love this light tote for summer! I have this exact tote is a solid brown leather and use it daily, so when I saw it as part of the sale, I took total advantage. 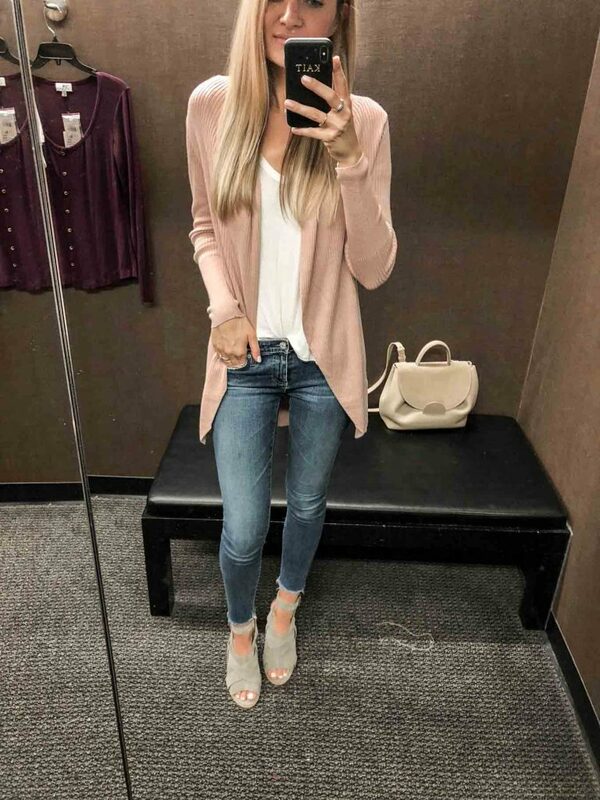 PINK CARDIGAN // FIT: true to size! I’m wearing a small. I cannot rave enough about this sweater. It was available in last year’s sale, and I’m so glad they brought it back this year. 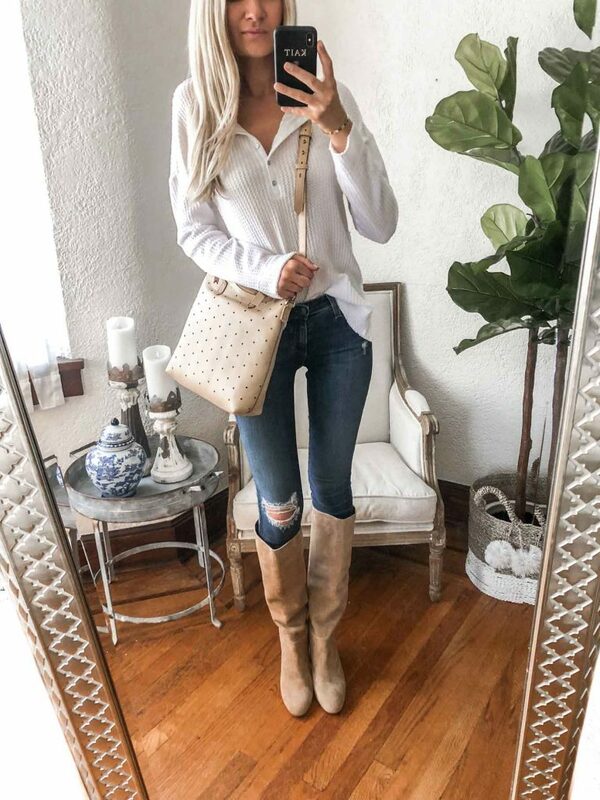 It’s the perfect length to wear with leggings or shorts, and when the weather gets cooler, you can layer a long sleeve tee or even a lighter sweater underneath it. Plus, it comes in a ton of colors. Definitely put this on your must buy list! Thanks so much for stopping by and happy shopping!